The Article shortly outlines the capabilities and components of CognitiveTEST. Together with Jenkins and testing framework; it provides a business-friendly solution for automated testing for ChatBot project. SIMPLE, FAST AND POWERFUL Testing Solution!!! 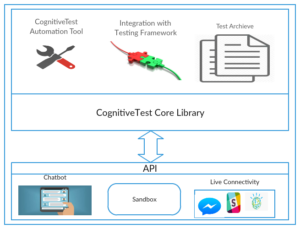 CognitiveTEST; designed by Nexright uses Artificial intelligence to perform ChatBot testing in minutes. Channel selection. Can Test Web Chat Bot and Facebook Chat. Element selection. Can Test Intent, Entity and Confidence. The solution is powered by IBM Watson AI services. During testing; it captures the test results and those used for future analysis. At the end; continuous Integration and delivery guidelines is used to automate and schedule the test using Jenkins. Overall, CognitiveTest is a business-friendly testing solution. A bright future and enriched user experience can be given with robust and right testing.